PeMobile – A Mobile-based Crowdsourcing Platform for Sustainable Primary Health Care! The following idea was published as a contest for the Knight News Challenge on 10th September, 2013. I am posting the idea as a blog for the readers of my blog. Find the original post here. I am planning to develop a Mobile-based crowdsourcing platform to harness data and information for the health of communities bridging the digital gap and paving the way for sustainable primary health care system. It is now a proved phenomenon that new technologies can play important roles in day-to-day life. However, in this time of digital revolution, some facts in regards to health situation in India are really disappointing. 50% of all Indian villagers have no access to healthcare providers; 10% of all Indian babies die before their first birthday; 45% women are married before they turn 18 and this results in early pregnancies, higher morbidity and mortality rates. Child marriage has consequences since this also leads to lower education and awareness levels where as a mother dies every ten minutes in India. Over 1.25 million children die annually and 48% of all Indian children have stunted growth due to malnutrition. 33% Indian people have no access to toilets, while 50% defecate in the open and more importantly and interestingly the UN reports, ‘India has more mobile phones than toilets’. Can we improve the health of communities? If yes, how to harness data and information for the health of communities? What could be the role of ICT in harnessing data and information for the health and communities? My idea is to develop a mobile application that will be pre-installed in a mobile phone. 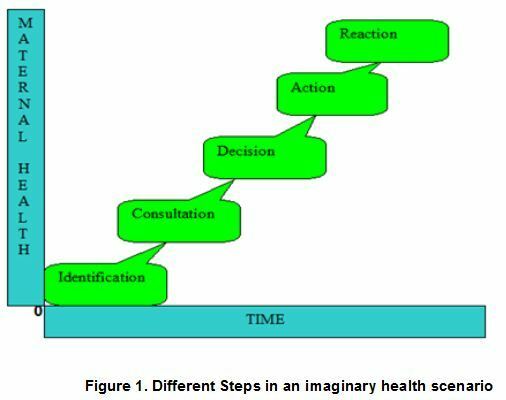 By using this application governments and other development organisations will be able to provide better and smart health service and involve maximum number of citizens to gather enough and accurate information about a particular health situation in the community. The mobile application will be operated under a sustainable ‘Digital Governance Framework’. The proposed framework will depend on different communication levels between government and citizens. The main idea behind this- is to develop a participatory digital framework (Fig. 2) where common people along with different health service providers together can participate at the same time and play important roles to solve a health problem of communities properly, quickly and smartly. Inspired by the idea of developing a sustainable digital active participation model, I should acknowledge the issue of ‘digital divide’ first. So, the question is ‘how to bridge the ‘digital gap’? Having in mind the present internet and potential mobile penetration rate, the first logical answer is, with the help of mobile devices we could potentially bridge the ‘digital gap’ as the penetration rate of mobile phone is greater and faster than any other digital communications tools and systems. So, primarily mobile can ensure the highest level of citizen participation in any initiative to have a real impact on the society. While explaining the ‘Model’, let us consider that ‘mGovApps’ (Fig. 4) is pre-installed application in a mobile phone. Let us also call this mobile as ‘Peoples’ Mobile’ (PeMobile i.e. Fig. 3). This proposed ‘PeMobile’ will have some basic functions like making and receiving calls; sending and receiving texts messages i.e. SMSes; taking photographs i.e. camera; and identifying the ‘PeMobile’ carrier’s location i.e. GPRS. Different pre-installed mobile applications for smart and better governance (mGovApps i.e. Fig. 4) will enable ‘PeMobile’ carriers to practice some of their basic rights. These mobile applications (Fig. 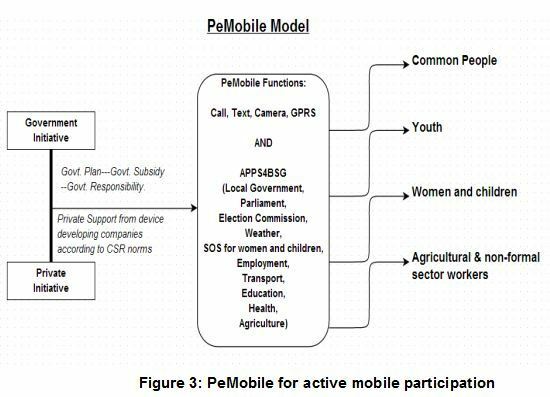 4) would be mainly public sector focused and pre-installed on each ‘PeMobile’ device and one of the applications would be to deal health-related issues. In an ideal scenario, all information will be available for citizens in their local language(s). The important principle of ‘PeMobile’ is that the government should play a massive role to develop this kind of service for better and smart governance to secure wider participation of common citizens. The initiative has to come from governments as ideally, ‘PeMobile’ would be used to provide better services to its’ own citizens. An ideal ‘PeMobile’ initiative would be government aided. Governments would provide up to 100% financial support and at the same time governments need to be in a position to ensure that every family owns at least one ‘PeMobile’. Governments also need to involve business and non-government development organizations. In one hand, mobile manufacturing companies could uphold their Corporate Social Responsibility (CSR) role towards the society by taking part in this initiative and on the other hand different non-government development organizations could develop the strategy to implement a project like this. Finally, to use this mobile application successfully, some factors have to be handled pro-actively and carefully. These factors are very crucial to implement m-governance through m-participation method. It has been mentioned earlier that the main factor is the mobile penetration rate for this type of initiative. 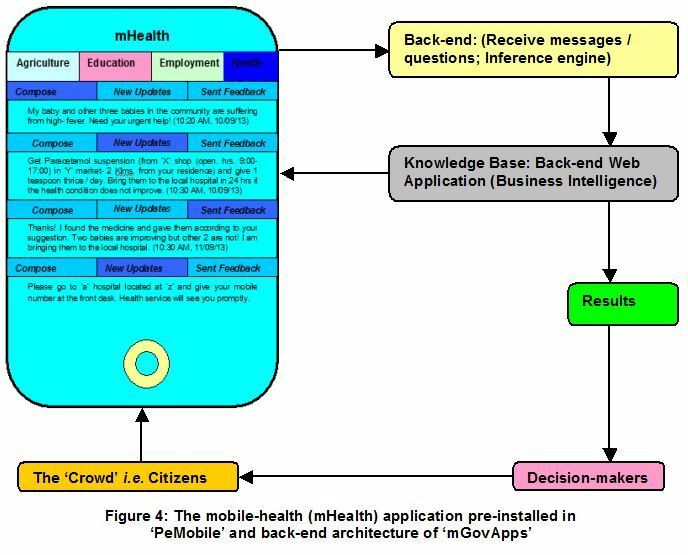 Without the high-level of mobile penetration, different crowdsourcing-based ‘mHealth’ or ‘mGovApps’ (Fig. 4) of PeMobile (Fig. 3) for smart and better governance will be at stake. Also governments need to have concrete promotional and strategic implementation plans for this. Without the promotional plan for this type of digital tool, government will not receive expected outcome. So, it’s the government again, who would have to take major responsibilities to promote the ‘PeMobile’ among their citizens. At the same time organizations like United Nations, International non-government organizations (INGOs), NGOs also could play a bigger role to promote ‘PeMobile’ among citizens. Good governance is just impossible without the active participation of common citizens. While government has responsibilities to take care of its’ own citizens, citizens also have duties towards their own government. To help governments to fulfil its responsibilities, citizens also have to be obliged of having at least one ‘PeMobile’ for a family. 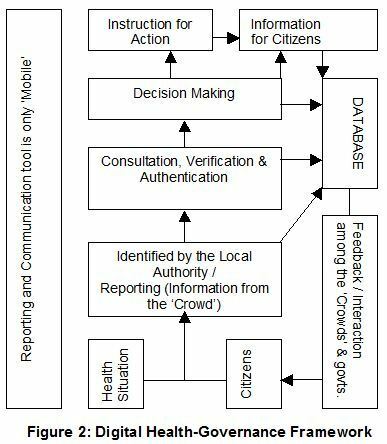 By using all development mobile applications including ‘mHealth’, citizens will provide raw data. Intelligence systems will analyze those data and produce result. By harnessing health related data and information in this way, governments and other development organisations can provide better and smart service for the health of communities. As government will provide financial aid, government needs to think about introducing policies to ensure that every family has at least one ‘PeMobile’ device with pre-installed mGovApps in it. Thus, the developing world could take necessary steps to use emerging information and technologies to ensure citizens’ participation to provide better services. This project aims to develop a Mobile-based crowdsourcing platform to harness data and information for the health of communities to bridge the digital gap and pave the way for sustainable primary health care system. Who is the audience for this project? How does it meet their needs? The project will be implemented on a pilot basis in one or two remote areas of West Bengal in India. This will help residents in remote areas to get primary health care advice in their mobile, make a direct link with the health care service providers in a minute, help not to waste valuable time travelling to one hospital to another and waiting hours to see a doctor and will also help to early detection of a potential epidemic or seasonal outbreak of diseases in remote areas. A successful implementation of this idea would involve a dedicated 4-5-member team of software developers, a very strong and interactive mobile API, 1000 of mobile sets to install ‘mHealth’ application and financial resources for promotional work and other logistic needs. This entry was posted in Crowdsourcing and Governance, DevThoughts and tagged crowdsourcing, Developing Countries, Health Care, India, PeMobile. Bookmark the permalink.